Many years ago before we had our boys, my husband and I, along with some friends, traveled to a bed and breakfast in Colorado for a long weekend. One morning for breakfast we were served this delicious cake. When I asked for the recipe, the innkeeper declined but I was determined. I wasn’t leaving without that recipe! The cake was that good! On the morning of our departure I asked again and was shown one of those checkout size cookbooklets, as I call them. On our way out of town we stopped at a market to pick up a copy. I’ve been making this cake ever since. It’s great for dessert or breakfast or lunch or a snack. You get my drift! This year I’m making it for our Thanksgiving dessert. Only my hubby likes pumpkin pie so unfortunately he’s outnumbered by the 4 of us. It’s a cake made completely from scratch and I’ve made it my own by adding dried cranberries. Don’t overcook the caramel glaze, which is also delicious on ice cream I might add, or it will harden too much. Before I get to the recipe, let’s have a chat about apples. I love to eat red delicious but they are not great for cooking. When I make apple pie, apple crisp or this wonderful cake, I tend to gravitate to granny smith. I have yet to find a market with a great choice of apple varieties in my area, thus limiting my choices. If you have a better selection in your market honey crisp, cortland or zestar are good choices. Apples are also good for you. After all everyone knows the an apple a day keeps the doctor away. Here’s why: an average apple is about 90 calories and is rich in fiber. So, you’ve waiting long enough…here’s the recipe along with a photo. Heat oven to 350 degrees F. Grease and flour 12-cup Bundt pan. Beat sugar, oil, eggs and vanilla in large bowl with electric mixer on medium speed until light and fluffy. Stir in flour, salt and baking soda until smooth. Stir in apples, cranberries and nuts. Pour batter into pan. Bake 1 hour to 1 hour 20 minutes or until toothpick inserted in center comes out clean. Cool 20 minutes and then remove from pan. Cool on a wire rack. Spoon Caramel Glaze over warm cake. Serve warm or cool. Cake serves 16. Heat all ingredients to boiling in 2 quart sauce pan, stirring occasionally. Boil 2 minutes, stirring constantly. Remove from heat and use immediately. 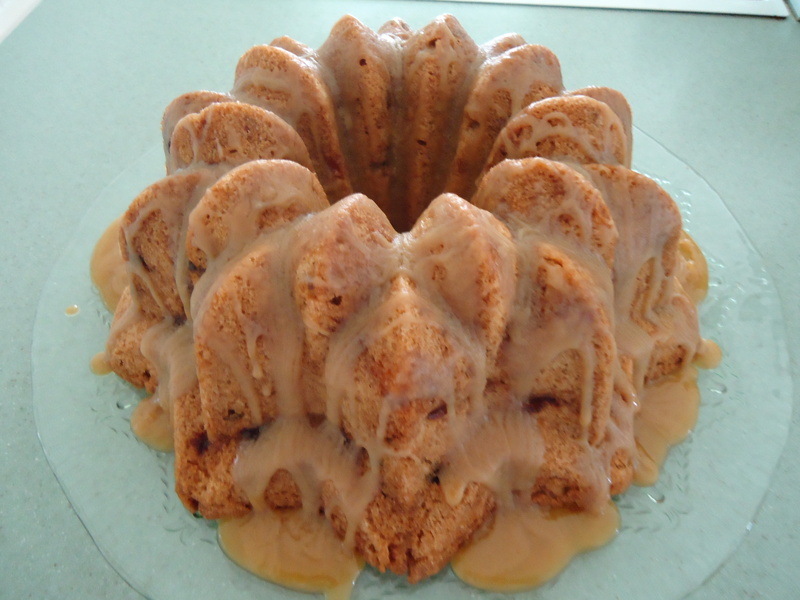 This entry was posted in Comfort Food, Company Worthy, Desserts, Entertaining, Sunday Dinner and tagged apple cake, apples, dried cranberries, pound cake. Bookmark the permalink. 2 Responses to My Favorite Fall Cake! Thanks for the friendship at Tasty Kitchen. Your blog is full of amazing stuff. This cake looks heavenly. Come follow me @ www. theredapronscravings.com. Just started following you.